Shalee Stuart uses the video interpreting service to explain imaging procedures in Spanish. The 12,000 residents in the northwest Iowa town of Storm Lake speak more than 25 languages and the community hospital is using advanced technology to communicate with its patients. 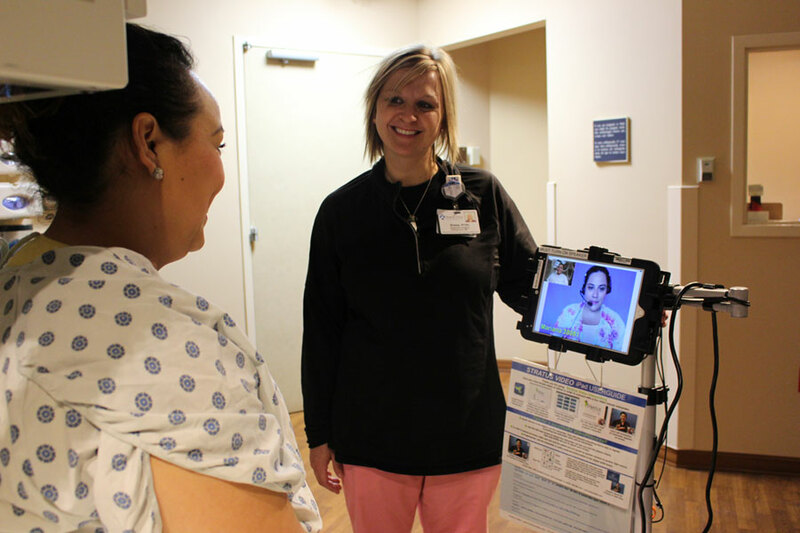 Katie Schwint, spokeswoman for the Buena Vista Regional Medical Center, says they’re among Iowa’s first hospitals to use VRI, a Video Remote Interpretation service. “It is on a tablet device similar to your iPad that we can roll around the hospital,” Schwint says. “It’s very mobile. We can position it for a patient to see, whether they’re sitting in a chair, lying in a bed, lying in an imaging device, so the patient can actually see the interpreter and the interpreter can see the patient.” Anyone who’s ever used Skype to reach out to a friend or relative knows how much richer conversations can be when you’re able to see the person with whom you’re speaking. 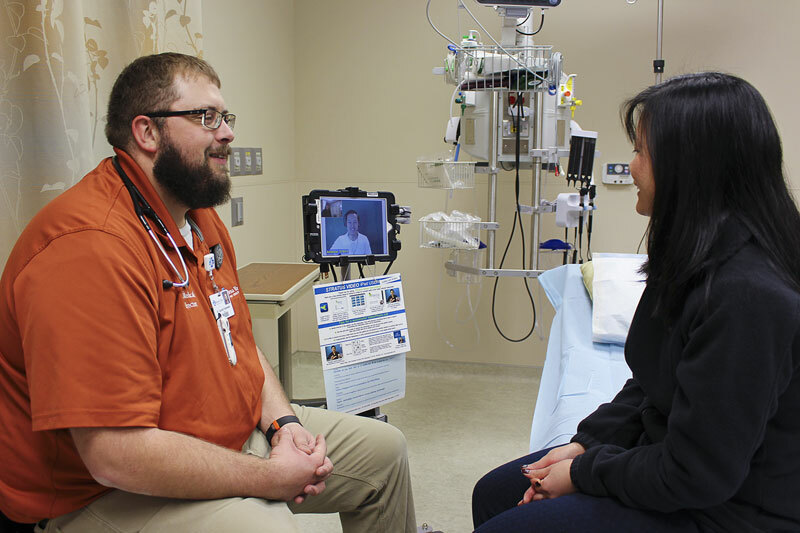 Dr. Garrett Feddersen uses the video interpreting service in the ER with a Vietnamese speaking patient. For a community in rural Iowa, Storm Lake has a remarkably diverse population thanks to various meat-packing and agricultural industries. Roughly 80 percent of the students in the school system are from different cultures. Schwint says many of the youngsters speak English but many times their parents don’t. She says it’s vital for adults to be able to talk with adults about pressing medical issues and not use a child to interpret. “Our staff in Storm Lake is very good at determining what languages people speak,” Schwint says, “but there’s also information on the device so people can point to which language they need.” The hospital’s old system used a speaker-phone interpretation service, but it was restricted by cords, making it less mobile, plus, it lacked the live video feature. The Wi-Fi tablet on a wheeled stand can be rolled right up to a patient, one button on the touch-screen is pressed to reveal the various language options, and after a selection is made, a medically-trained interpreter appears on-screen within 30 seconds. “If a clinical person gives instructions like, ‘Take two pills, drink some water, wait six hours,’ they can actually write so the patient can see that on what we call a white board,” Schwint says. 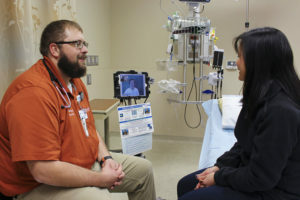 “Then, a lot of our patients will take their smart phones and take a picture of it so they can take those instructions home with them.” Schwint says the VRI technology allows the hospital to provide the best possible care to anyone who comes through the door.